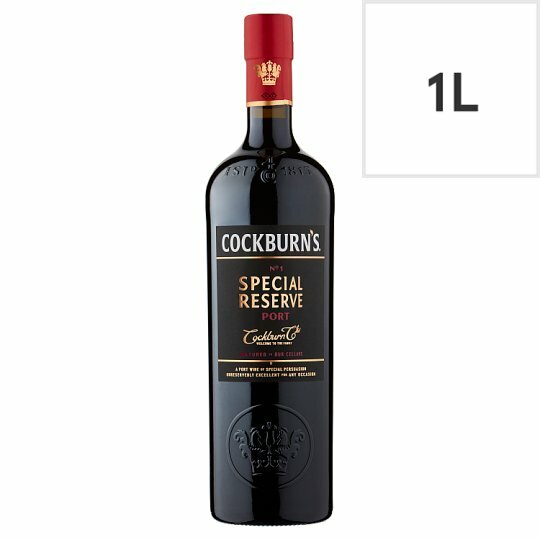 Cockburn's Special Reserve was originally introduced in 1969 as the first great Reserve Port and since that time its famous fruity and full-bodied quality, combined with a fine dry finish, has been the benchmark for all Reserve Ports. Cockburn's, one of the greatest names in Port, led the development of vineyards in Portugal's Upper Douro valley in the 19th and 20th centuries. The company is owned by the Symington family, Port producers for over 125 years. Garnet red colour. A youthful nose packed with rich and concentrated aromas of red fruits, On the palate sweet, well rounded, medium length and with luscious red berry flavours leading to a distinctive dry finish, balanced with fine wood-aged flavours. Grapes for our ports are picked by hand and transported to the winery in small crates. The grapes are then placed into large shallow tanks where the grapes were traditionally trodden by foot but more recently machines with rubber ‘feet' are being used. Fermentation lasts for about 48 hours. When the alcohol and sugar are at the desired levels, the fermentation is arrested by the addition a pure grape spirit. The Port wines are then aged in large oak casks until ready to bottle. Port wine is produced in the Douro valley which was defined and established as a protected region in 1756, making it the oldest defined, regulated and protected wine region in the world. Port became popular in England during the 1700's after the Methuen Treaty was signed in 1703. Merchants were allowed to import Port wine at low duty rate while war with France deprived them of French wines. The Port region has three areas. Baixo Corgo is the western most area and the wettest in terms of rainfall. Grapes from here are used for inexpensive Ruby and Tawny Ports. Further upstream is Cima Corgo centred on the town of Pinhao. This region is hotter and drier. Grapes grown here are used for Vintage and LBV Ports. Even further upstream is the Douro Superior the hottest of all three regions. Not widely cultivated due to the accessibility of the area. Port is produced here in small quantities.